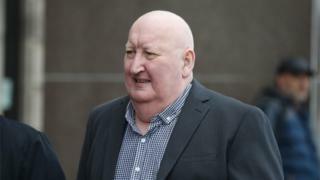 The driver of the bin lorry that crashed in Glasgow killing six people has been banned from driving for three years. Harry Clarke was also ordered to carry out 150 hours of unpaid work and will be tagged for four months. At an earlier hearing Clarke, 60, admitted culpable and reckless driving nine months after the fatal crash. He had his licence withdrawn for medical reasons following the bin lorry crash on 22 December 2014. Clarke, from Baillieston, pleaded guilty at Glasgow Sheriff Court to driving a car on 20 September 2015, despite knowing he was unfit to drive. Clarke admitted driving the car in the knowledge that he had suffered a loss of consciousness while at the wheel of a moving refuse collection vehicle the previous December. The charge stated he also knew he had suffered a loss of consciousness or episode of altered awareness while at the wheel of a stationary bus on 7 April 2010. Clarke was not prosecuted over the bin lorry crash. However, his licence had been revoked for 12 months on 27 June 2015. Passing sentence, Sheriff Martin Jones QC said: "You must understand that the decision you made to drive your vehicle on the road, even for a short distance, was one which was wholly irresponsible and reprehensible. "It was highly culpable and placed the safety of the public at risk. That was a risk which had been fully explained to you and led to the revocation of your driving licence on medical grounds. "You must have been acutely aware of the possible consequences of you suffering a loss of consciousness while driving following the tragic consequences arising from the incident on 22 December 2014." Senior Fiscal Depute Mark Allan told the court a neighbour spotted Clarke driving out of the car park of his home in the Baillieston area of Glasgow at about 20:00 on the evening of 20 September 2015 and called the police. He said: "Mr Clarke was rummaging in the boot of his car and the neighbour went home and told his girlfriend, and they looked out of the window. "After watching for 30 seconds to two minutes, both saw the accused get into the driver's seat, switch on the lights and drive out of the car park onto Buchanan Street. He was the sole occupant of the car. "Both were suspicious about his ability to drive because of the media coverage and they did some research online and found that his licence had been revoked on medical grounds. They called the police at 8.04pm. "While waiting for the police between 10.15pm and 10.20pm, they saw his car return again to the car park and it parked up in the usual space. "He got out and went to the boot to get carrier bags." After Clarke was cautioned and charged, the court was told, he said to police: "I have never been out on a public road, I've just moved the car in the private car park." The restriction of liberty order enforced by the tagging means he will not be able to leave his home between 19:00 and 07:00. Ross Yuill, defending Clarke, said his client had driven the car for about 30 yards on the public road. He added: "He wholly accepts that that decision was a gross error of judgment." In relation to the 2014 bin lorry crash, the Crown Office insisted there was insufficient evidence to raise criminal proceedings against Clarke. However, in a rare legal move, relatives of three crash victims sought permission from senior judges to bring charges against him in a private prosecution. Despite that, judges at the Appeal Court in Edinburgh ruled in November last year that the family could not launch a private prosecution. A fatal accident inquiry (FAI) heard Clarke had a history of health issues but had not disclosed his medical background to his employers or the DVLA. It also emerged that he had previously blacked out while working as a bus driver but failed to disclose it when he became a bin lorry driver with Glasgow City Council.